Replacement:DEV-09716. We switched over to a surface-mount header. This page is for reference only. A small dip or jumper for 5V on/off would be great. Anyone know of a switch or set of jumpers that could be soldered to the 3.3v / 5v pads on the bottom? I'd hate to have to break out my soldering iron each time I wanted to switch boards. I second this, can we get a version that has a switch to select 3.3 or 5 volts? you could solder a switch on the jumper pads to change back and forth between the 3.3v and 5v version. The pitch on those switches is WAY too big for those pads... I would say any switch is. The switch would probably have to hang down on wires. hmm. No 5V. The switch is in the enable position. Am I missing something obvious like a solder jumper? Help please. The FTDI chip's datasheet says that pin 23 is TX LED and pin 22 is RX LED, by default. In this breakout schematic, this is how they are connected. However, in Arduino Diecimila schematic, they are switched. We've implemented the FT232RL in a board of ours, and used the pinout suggested by the datasheet, but this seems reversed. When we send a character to our board, the TX LED lights up, suggesting an incorrect datasheet, and a correct hook-up would be that of the Arduino Diecimila (labeled GPIO1 and GPIO0 instead of CBUS0 and CBUS1, respectively). This breakout board's TX and RX LEDs function properly? It functions properly. Maybe there's a bad datasheet somewhere. Both the Arduino and this board work as advertised. I bought one of these to program a Mini Arduiono Pro and it worked fine for a while but now I'm getting an error (stk500_disable(): protocol error, expect=0x14, resp=0x51). I've tried manually reseting the mini pro to no avail. I bought a new one of these in case that was the problem, still no joy. I've tried a second Mini Pro that I've got, even less joy. Any suggestions would be appreciated. Are you sure you're telling the Arduino software the correct serial port number? I've also tried using the reset button on the pro mini before loading the sketch. I notice that LED13 does not blink when I do this, I believe it is supposed to. I'd think it was just a bad mini, but both of them are doing it. Yup. The board flashes its tx light 3 times, but then nothing. I am looking for a simple data-pipe. Currently I am using a bluesmirf to go between Processing and a Picaxe --I would like to do the same thing but with a wire. I want the computer to "see" a serial port when I plug it in, and I want a simple UART (data_in --> same_data_out) kinda thing. --Is this unit the correct one to use? I am using Ardupilot mega which uses ATmega 1280 processor. 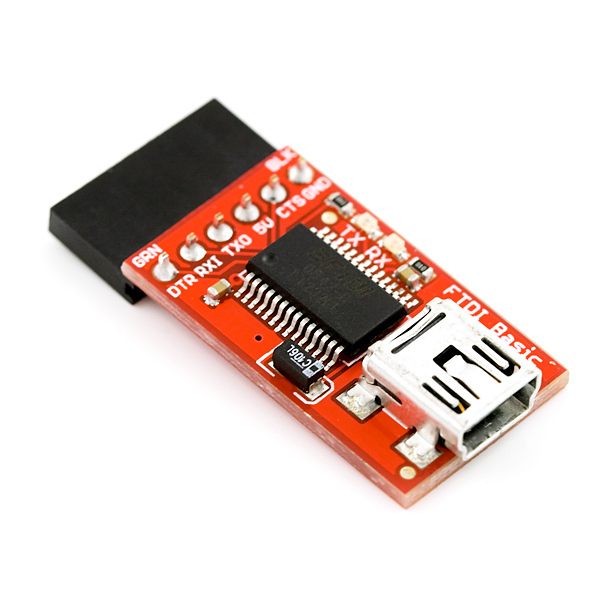 on the webpage for ardupilot mega, it recommends a 3v3 FTDI basic or a 5v power, 3v3 for communication FTDI USB cable. My questionis, does ATmega use 3v3 logic or 5V logic? The 1280 can use either 3.3V or 5V digital supply voltage. Will this power the target or do I need to provide external power to my arduino while programming? Oh and the host initializes the device once you plug it in. So you will indeed get 0.5A rather than 50mA. It powers the target. The USB standard is 500mA on an initialized port or hub or whatever the bejesus the thingy sticking out of my computer is called and 50mA on an uninitialized thingy. Because the 5V header on the FTDI basic is connected directly to VBus, you will be able to supply your Arduino with 0.5A*5V=2.5W. How much current can this board source from the 5v pin. I'm trying to buld a pic programmer, from a circuit I found for a programmer uses an FTDI chip like this one, and as I haave this board, so the plan was to use it. I don't however want to have to carry a 15v PSU around with me, so want to power it off the USB port (I have a circuit for a voltage Booster to get 13v VPP from 5v). Is this board able to supply 50mA for Vdd, and 200mA for the Booster to get Vpp? so 250mA to 300mA ish. Unless I'm missing something this should be able to source 500mA per the USB2.0 spec. Note also that newer PICs support low-voltage programming, so you may not need the booster circuit. Could i program attiny chips with this? 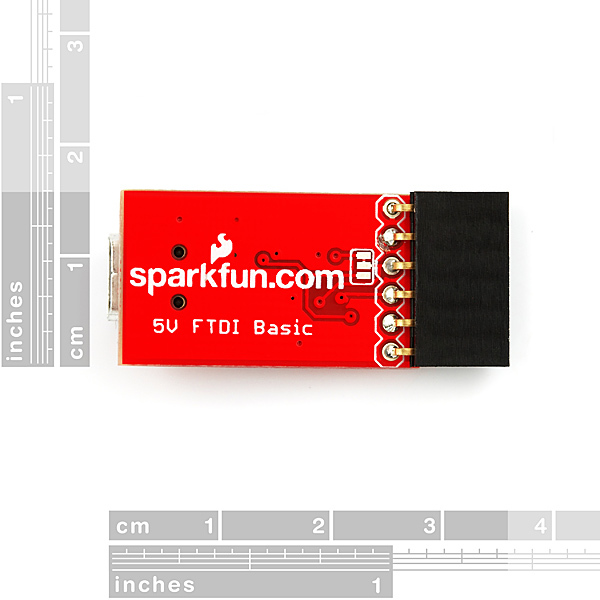 Like this one http://www.sparkfun.com/commerce/product_info.php?products_id=9378? I connected the IMU via FTDI breakout board to PC and i am getting the data. This means my FTDI breakout to Arduino interface is not working. Can you guys suggest any way i can accomplish this interface? Is it possible to connect the Tx/Rx, Rx/Tx, Gnds and 3.3Vs together of arduino and FTDI breakout board for serial communication. In this case what am i supposed to do with the CTS and DTR pins as Arduino dont have these? Q: How might it be used for an DIY Arduino Breadboard auto-reset upload? I tried the FTDI basic DTR out line with a 100 nanofarad cap to the reset pin in the breadboard (with existing 10K pullup and open tactile switch) with the hope of auto-reset on uploading from the Arduino IDE (in Mac OS X). A bit late, but better late then never. A 0.1uF(code 104) cap in series with the DTR pin and Reset pin will allow the IDE to auto-reset the board. I also have tested 10pF(code 101) and found it to work as well. Don't forget your pullup resistor on the Reset pin as well, and double check your reset switch to make sure you're not holding the chip in a constant reset by using the wrong legs of the chip. I just got this little board and ran into the same problem. The only solution I've found is making sure that TX, RX, +5V, and GND are all connected, and reseting the Arduino just as I upload the code (you have to be quick). As for this "auto reset" feature... anyone wanna give me a heads up on how it works? Can this board be used to upload sketches to the Arduino. I tried by hooking the TX port on the FTDI to RX port(Pin 2 on the Arduino) and RX port to pin 3 on the Arduino. But so far I am not abe to upload anything. The driver for the board load fine. Is TXDEN pin available anywhere in the breakout ? It is just to be used with a 485 transreceiver to control the DE pin. Could this be considered a replacement/equivalent to an FTDI cable? Don't think so... (somebody correct me here) I'm having problems with it and an Xbee when I try and update the firmware. Thanks for the quick response. Do I leave the grounds isolated as well? My micro is running on its own external power. Do I need to connect my board's 5V/GND with the 5V/GND of the FTDI breakout? This is confusing me. I don't want to source power from the USB. If your ?C is being powered with 5v you do not need to connect the pin on the FTDI Basic Breakout labeled 5v to your ?C. Keep in mind that the power supply for your ?C needs to be 5v because the transmit and receive pins (tx and rx) of the FTDI breakout are outputting 5v logic levels. I did some simple testing with an ATMega8 and PySerial; worked great, thanks! You need to come up with some kind of connector for the pro-minis that would allow square pins to make firm contact. Mill-max has some off the shelf, but they require larger diameter holes. A male connector by itself doesn't really help since the problem is the boards are loose. A clip with something like sideways pogo pins that would seat into the holes (and maybe fit into the existing female connector) would be a much bigger help. Actually individual clips or one that could be rewired would help even more, then I could use them on something like the Venus GPS breakout. Mine do get some abuse, but I don't think a surface mount connector would be a problem. Hello everybody! I have a couple questions, and I would really love your feedback. Thanks in advance!! Would you like a version of this board with male headers? I thought this might be more useful when programming our Arduino Pro minis. Any thoughts? I know you can just shove a 6-pin male breakaway header in there and your done, but I always try and cut any unnecessary links in the chain out, if ya can. Would you mind if we went to an SMD part for the header? How much abuse are these boards getting? I have been pretty impressed with the strength of some of our SMD headers, but i know they will always be arguably less durable that a thru-hole part. Yes, I would love a simple way to reprogram the mini's. The only reason I didn't order them for my last order over the pro's, is the difficulty of reprogramming, much faster to reprogram a pro. Is there a diagram or instructions on how to switch to 3.3V? I see three very tiny pads on the back but don't know what to do with them. If you look close enough there is a trace between the pad on top and the pad in the middle (http://www.sparkfun.com/commerce/images/products/09115-02-L.jpg). Cut this trace, solder the remaining (bootom) pad to the pad in the middle and you are done. any idea as to the time frame that these won't be sold out? I'm completely aware of modifying the 3v version to work with my arduino pro (5v), but I don't want to. 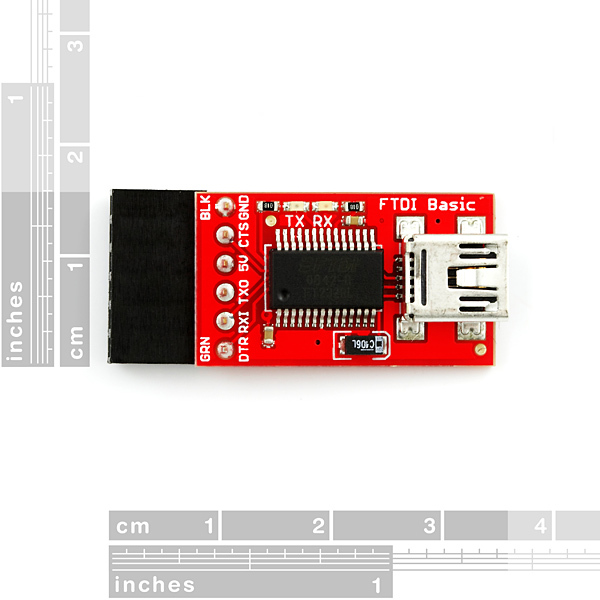 The schematic shows that you've skipped the ferrite bean on the USB power line as recommended in the FTDI datasheet. Any comment on this omission? Is it likely to cause speed or reliability problems due to noise? I've got my own breakout board coming together, and it would be convenient for me to skip the ferrite bead too because I don't have any handy. I'm interested to hear about the practical impact of this decision. Ferrite beads are used to suppress high-frequency noise. Most USB cords I've seen loop around a big one in the cord itself (they're those big round things near one of the ends). I suppose FTDI recommends them for the USB cords that don't have one. Even if the cord doesn't have one, and there isn't one on the board, doesn't a small capacitor between ground and supply do the same thing? Any idea why the TX and RX LEDs don't flash when uploading code with Arduino? They do on the 3.3v version of this board. Odd, I have been useing the 3.3v version on my Arduino pro mini - 5v version for some time now. No issues. I was forced to use a 3.3V FTDI board on a 5V model and it worked except the TX speed was double what I had set the serial bus to operate at! Took a few hours to de-bug this problem. The 3.3 operates at 8 Mhz, the 5V operates at 16 MHz. :( i should of waited for this one instead of the 3.3 volt version. Oh well... 3.3V is still a logic high for 5 volts.